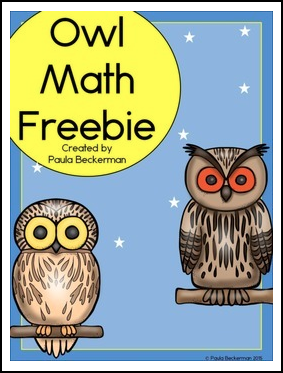 Addition, subtraction, and ordering by size are all fun with this Owl Math Freebie! Students will solve addition or subtraction problems and then color by number, and will cut and paste owl lengths from shortest to longest. Simply print and go to add some owl themed fun to your math class! Owl Math, which includes 6 addition and 6 subtraction pages! Patterns with Bats and Owls. Thank you for visiting Paula's Preschool and Kindergarten. All new products are 50% off for the first 24 hours. To be notified when new products become available, and of upcoming sales, please click on the green star below my store name and follow me. Followers and feedback are greatly appreciated! By downloading this item, you are agreeing that the product is the property of Paula’s Preschool and Kindergarten and licensed to you as a single user, to use for personal and classroom use only. Paula’s Preschool and Kindergarten retains the copyright and reserves all rights to this product. You may not claim this work as your own, sell this product to others or share this product with others.